Last week, we introduced Vocabulary Self-Collection Plus (VSSPlus). Our goal in modifying this time-tested approach (Haggard, 1982) for the digital age (Grisham, Smetana, & Wolsey, in press) was to create an intersection where students might interact with each other in face-to-face spaces to add depth to their vocabulary and concept knowledge. At the same time, we wanted to use technology in a generative way (Grisham & Smetana, 2011) so that students became proficient users of technology while learning academic vocabulary related to their science lesson. This week, want to introduce the technologies we used, and share some lessons learned. We chose two presentation methods, PowerPoint® and Thinglink, for the students’ e-dictionary entries. However, many other tools are possible options. Students might use Voicethread, Prezi, or Popplet, for example. In our work with these fifth-graders, we chose to limit the tools to one that is more familiar to them, and one that would be new. Embedded in the technology task, we also helped students create audio recordings and showed them how to further deepen their word learning using the Wordsift website. In Wordsift, students type in a word and produce a visual that links synonyms and related words. For example, “melting point” is a science term students in fifth-grade might be expected to know. 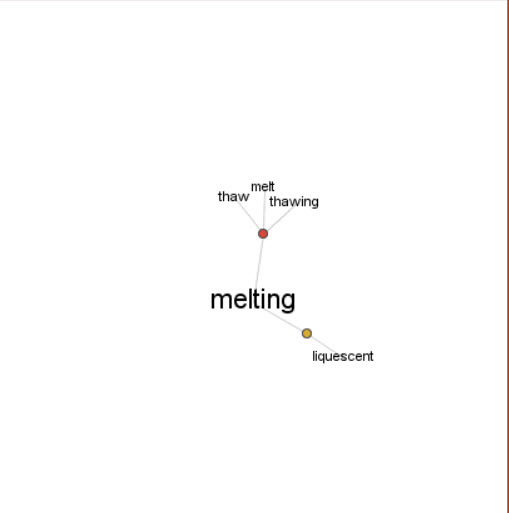 By entering “melt” into the Wordsift visual thesaurus, students see related terms including Latinate versions and synonyms. Please see figure 1. In addition, Wordsift has many other capabilities including creating a word cloud, executing an image search, or sorting words according to academic word lists. Students in our exploratory group did not have access to screen capture tools, but a few used drawing tools to recreate the visual thesaurus they created in Wordsift. While PowerPoint is a familiar tool to many, some features are not widely known. We recently asked a group of teacher candidates if they knew PowerPoint could support narration they created, and only two responded that they knew of this feature. In our work with fifth-graders, the students use voice recorders to create the audio, and then they attached those to the PowerPoint slide. We found that saving the slide as a PowerPoint show (rather than a regular PowerPoint) kept all the audio intact and could be used on any computer using free PowerPoint Show software if the regular version of PowerPoint was not available. Many of the students in the class started out exploring Thinglink, but because they were more comfortable with PowerPoint and recognized the time constraints of the task, switched to that format. Learn more about adding audio narration to PowerPoint by clicking here. The Thinglink tool intrigued students, but it required some playing around as they tried to figure out how best to use the tool. In PowerPoint, students could add text and images in any order, but in Thinglink, they needed to locate an appropriate image first. Then, they could use the editing tools to tag the image with the text such as their definitions and rationales. Find out more about Thinglink and view some examples by clicking here. An additional challenge was to upload the audio portion of the VSSPlus presentations to a podcast sharing site (we used Podbean), then link the podcast to the Thinglink. To save time and avoid student frustration, we did this for the students. For this reason, it was very important that students included their group names on the Thinglink as well as in their audio narration making it possible to easily match up the files. Figure 2 is an embedded Thinglink created by students you can try. We used Wikispaces to create the first page of the e-dictionary which you can see in figure 3 below. Additional pages for future learning can be added easily. Students and parents can view the work at will, and learn from each other’s presentations. Other wiki tools, blogs, or even a learning management system (Canvas, BlackBoard, etc.) might be used to host the e-dictionary. The first time out took a little over three hours because students had to learn to use certain aspects of the technology (inserting images, finding images, creating audio files, and so on). However, in the future, they will not have this hurdle, and the task will proceed much more rapidly. The important aspect of this task is that students had to discuss the terms amongst themselves, evaluate the relevant aspects of images they chose together, plan their audio components, and work as a team to assemble the final product. Throughout the process, they became deeply aware of the relevant attributes of the concept represented by the term and also what it was not, in some cases. For future VSSPlus projects, we would appoint a Wikispaces librarian whose job is to put the final presentations in the e-dictionary. Some students were more adept at using the audio recording tools, and would become the audio engineers. Thinglink aficionados are appointed the go-to person for Thinglink questions, and PowerPoint specialists who know how to link or insert audio, use the drawing tools, and save in PowerPoint Show format would have a place to shine. Finally, a means of sharing the work is needed. A data projector with each group presenting their work to the class is a good start. If the classroom has a few computers or laptops, students could rotate through stations viewing and listening to the presentations at some stations while doing other academic work at different stations. We hope you will try VSSPlus. Let us know what ideas you have to change it up and how well your students learned from the experience. Haggard, M. (1982) The vocabulary self-collection strategy: An active approach to word learning. Journal of Reading, 26(3), pp. 203-207. Grisham, D. L., Smetana, L., & Wolsey, T.D. (in preparation). Post-reading vocabulary development through VSSPlus. In T. Rasinski, R. Ferdig, & K. Pytash, (Eds.). Technology and reading [working title]. Bloomington, IN: Solution-Tree.